It was damp, grey and cold on the Friday I left for Deerfield and my overnight stay at the Deerfield Inn. A snowstorm was predicted to roll into Boston on Saturday, so it wasn’t the ideal time to take a roadtrip. 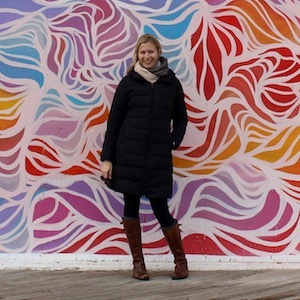 However, since I had been cooped up since Christmas due to a serious illness, I was willing to risk getting stuck in middle-of-nowhere Massachusetts for the chance to get out of the house. It would be my first visit to Deerfield – a tiny town of a little more than 5,000 residents in Franklin County – even though every summer my dad and I head a few miles north to Greenfield for the Green River Music Festival. Not having much time to do any research before my trip, I really had no idea what would be waiting for me there. And considering the last few miles on 91 North are spent driving through sparsely populated farmland, I wasn’t expecting much. So I was completely surprised by the idyllic scene that opened up before me when I took a right turn onto Main St., the mile-long road lined with large, old oak trees and colonial-era homes on spacious lots that runs through the center of Old Deerfield. A National Historic Landmark District, the village retains the same scale and town plan as when it was settled by English colonists in the late 1600s. It’s as if you took a wrong turn and ended up in the English countryside 200 years ago. I found the Deerfield Inn about half-way down the road and pulled up right out front. 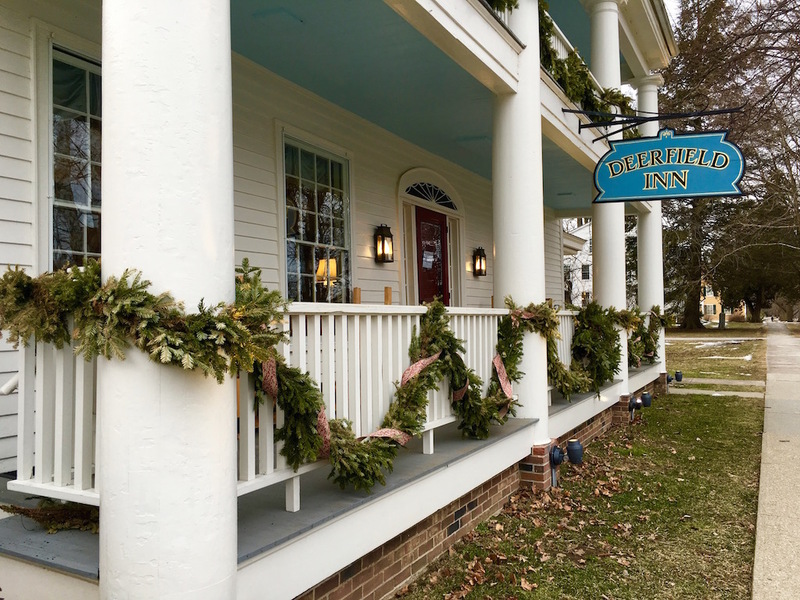 The main inn looks much like it did when it was built in 1884, with a white facade and wide columns supporting a two-story front porch still decorated with holiday greens. The inn has 24 guestrooms between the main inn, located just steps off the sidewalk, and its carriage house in the back. Following a quick check in, I was shown to my room on the second floor – named “Cora Carlisle” after one of the early innkeepers. 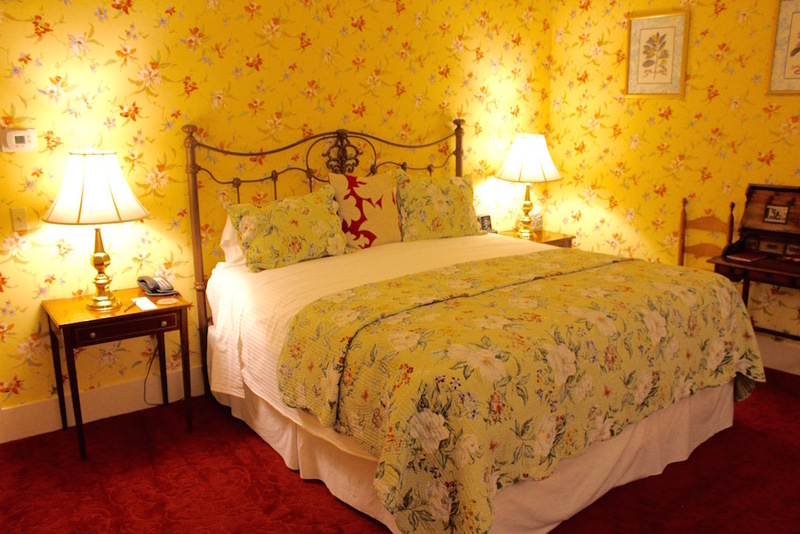 The cheery yellow wallpaper, deep cherry carpet and bright white bedspread that greeted me inside the spacious room brightened up the dreary day. 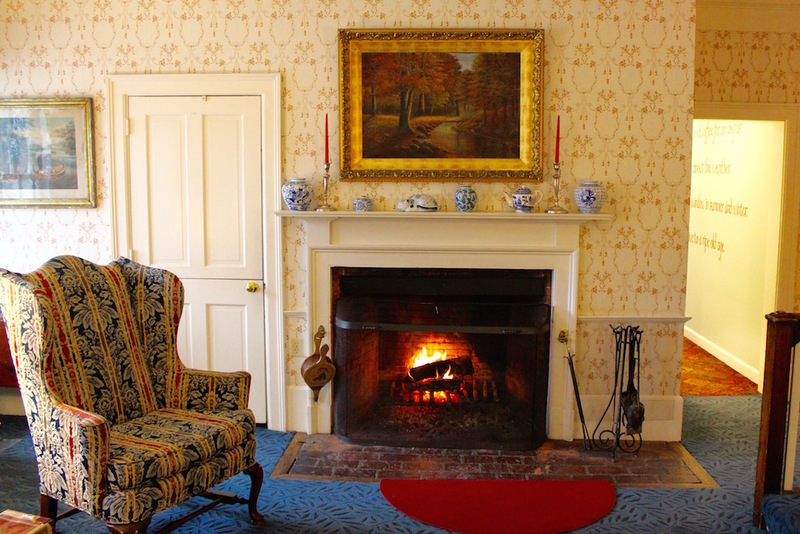 Since a walk was out of the question – it had started to get dark about 4 p.m. – I went back downstairs spent a few hours before dinner reading in front of the fireplace in the cozy lobby area, and then enjoying tea and cookies in the more formal sitting room. Given the weather, I was happy to not have to venture too far for dinner. 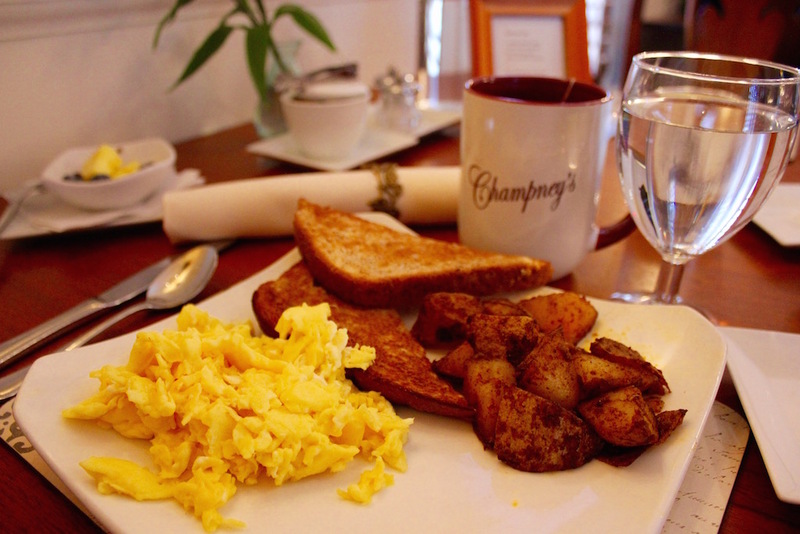 Champney’s Restaurant & Tavern is a “farm to fork restaurant” located on the first floor of the inn that features seasonal, local products. Seated at the large oak bar for the evening, I used my night away as an excuse to indulge in some comfort food – my dinner consisted of a heading plate of perfectly crisp sweet potato fries (my guilty pleasure!) and thick, creamy cauliflower soup that I paired with a flight of craft beers. The next morning, following a deep sleep, I enjoyed a hearty breakfast of eggs, toast and hash browns in the adjoining dining room. With only an hour to spare before checkout, I decided to finally brave the bitter air and explore the village. 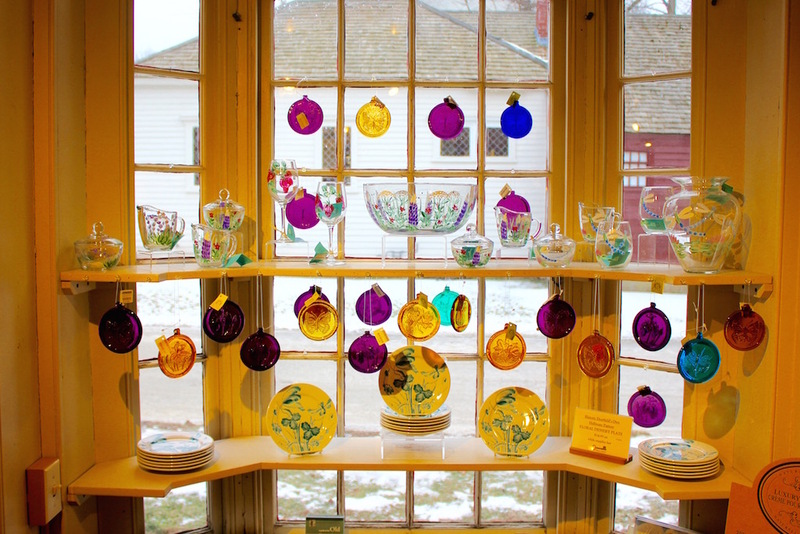 First stop was the charming Museum Gift Shop and Bookstore next door to the inn. It had a large and eclectic mix of pottery, food items, home décor, candles, books, and educational gifts for kids, and after much deliberation, I picked out loose tea for me, maple syrup for parents, a book on Presidents for my nephew, and some fun buttons for my book club. Back outside, I headed on foot toward the far end of Main St. I couldn’t help but to stop and photograph nearly every one of the homes I passed until my fingers were almost too frozen to operate the camera. The homes, some of which date back to the 1700s, feature dramatic color pallets and unique architectural details that I found fascinating (I made a photo collage of eight doors, which turned out to be a very popular Facebook post). Twelve homes of particular significance are preserved as “Museum Houses” and can be toured from mid-April through mid-December, while the rest are privately owned. Since there are few tourists around this time of year, and I’m sure the residents were all staying warm indoors, it really did feel like I was in a museum (albeit a deserted one). 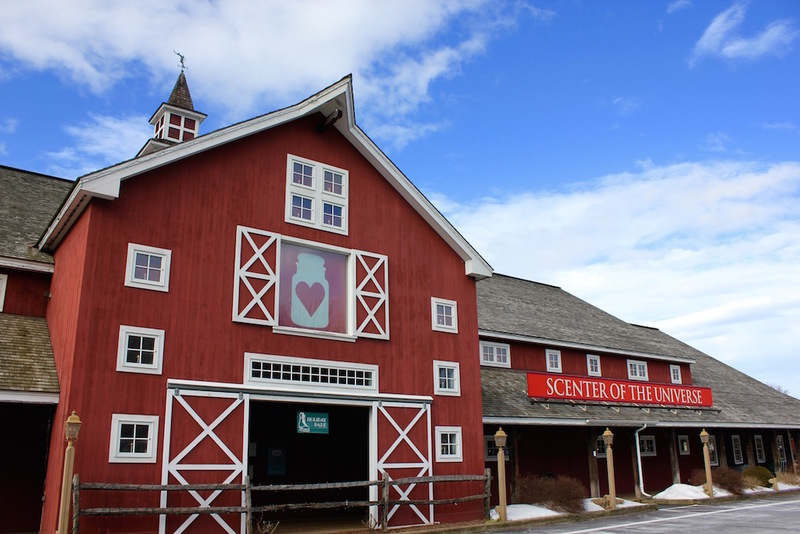 I pulled out of Old Deerfield around noon, excited for my final destination of the day, which I had been wanting to visit for years – Yankee Candle Village, a.k.a. the “Scenter of the Universe” (get it?! ), in South Deerfield. 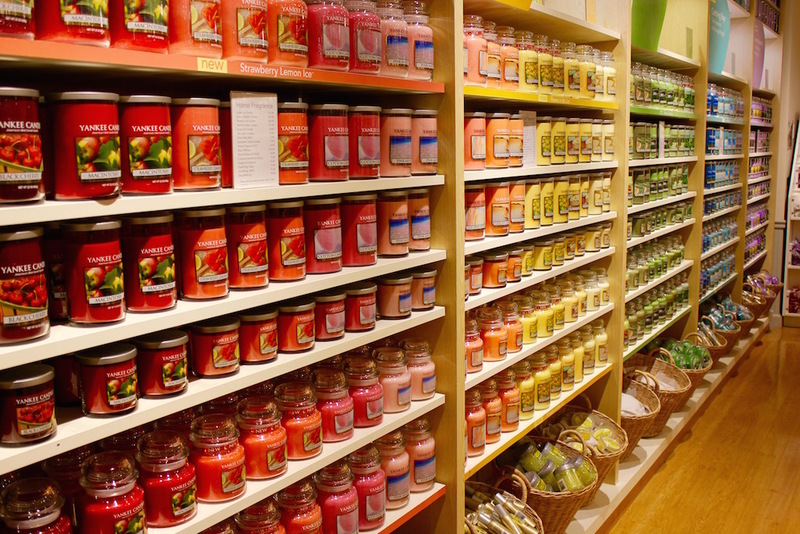 Although I was totally overwhelmed by the selection – 400,000 candles in 200 different scents – I managed to grab a few things (by “a few things” I mean $50+ worth of candles I really didn’t need). Knowing I squeezed in as much as I could in less than 24 hours in that charming corner of “Happy Valley” and needing to get back to Boston before the storm, I hit the road about 2 p.m. – arriving home just before the snow started to fall. 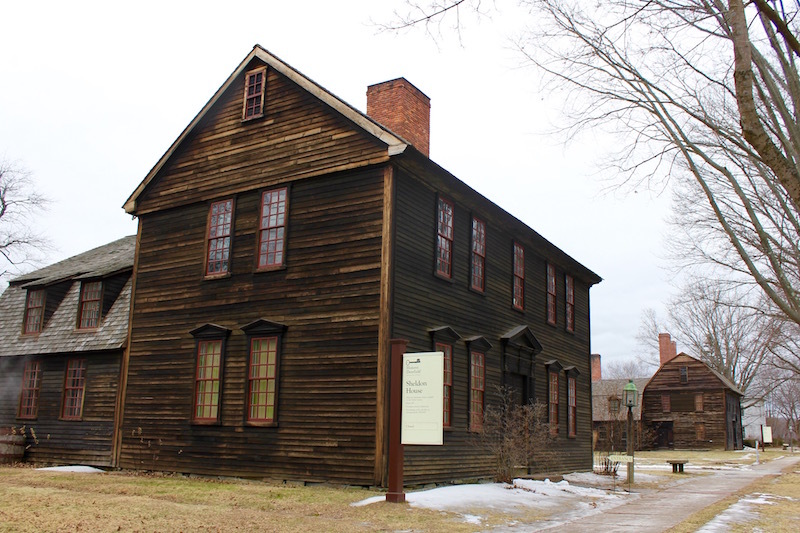 Flynt Center of Early New England Life – This destination is also high on my list for when I return to Deerfield. It’s a 27,000-sq. ft. (!) 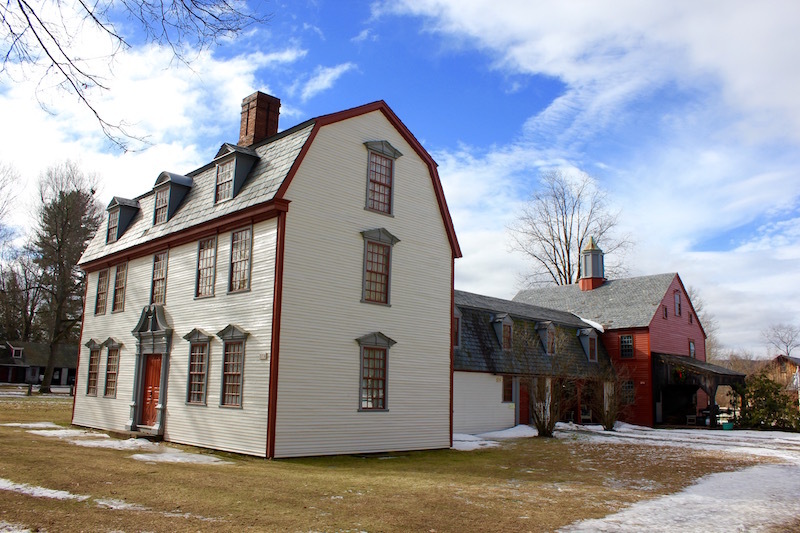 facility that features both permanent and rotating exhibits chronicling (what else) life in early New England through furniture, metalwork, costumes, and more. Butterfly Conservatory & Gardens (South Deerfield) – The innkeeper, Jane Howard, recommended this unique destination to me, but I didn’t have the opportunity to check it out myself. It features an 8,000-sq. ft. (!) glass conservatory filled with butterflies. Wolfie’s (South Deerfield) – A friend who used to live in Greenfield told me that this is a great pub, but I was too comfortable at the Deerfield Inn to venture out in the cold for drinks. 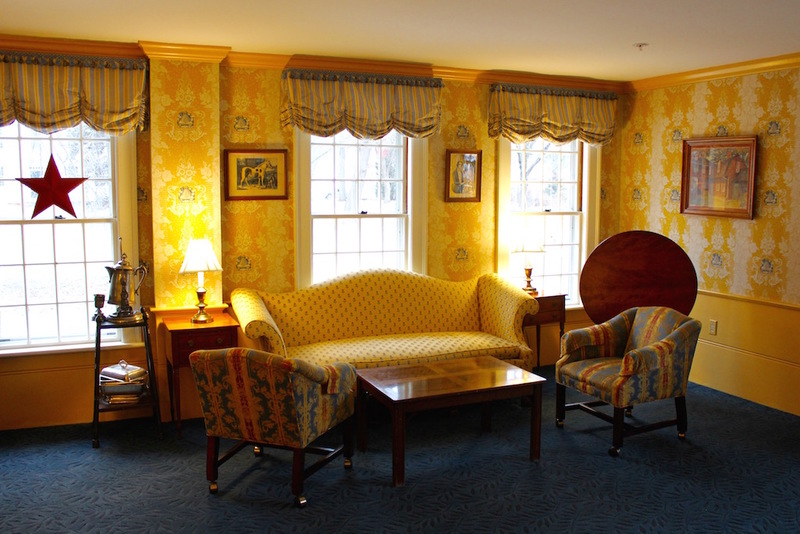 I was a guest of the Deerfield Inn, thanks to a collaboration with Select Registry. All opinions are my own.